On Tuesday March 15, the MMM team met with Ithaka ISK teachers and Mira Media for a half-day teach-the-teachers workshop. The group of teachers, having shown interest in the program, will fulfill an important role as media literacy ambassadors in the school. In the second week of April of 2018, they will take the lead during the Media Literacy Week in teaching two school classes in critical media literacy through making media. This week will draw on our shared pilot experiences running a 3-month critical media literacy program last year. The MMM team will also be present to support teachers and students. During the teach-the-teacher workshop, we started with a hands-on assignment. 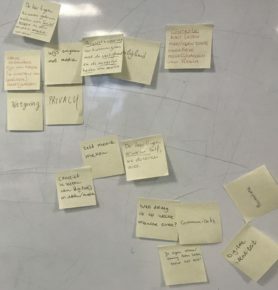 Subsequently, we conducted a brainstorm session to work towards shared principles of on what media literacy could entail for us, in the particular context of working with young migrants. In pairs, workshop participants wrote down their media literacy keywords on post-its, which were collected and thematically discussed. -Balancing safety concerns, including personal conceptions of privacy and legal frameworks with opportunities including strategic self-presentation such as in vlogs and Video CV’s. -“Critical consciousness” of media technologies as instruments to search, gather and assess information as a way to “understand media manipulation”. -Awareness of the opportunities and constraints of generating a financial income through vlogging and producing other audiovisual and written media. -“Sharing of expertise”: students learn from teachers and teachers learn from students. Students might have technical skills teachers lack, teachers might offer means for reflection and vice versa. 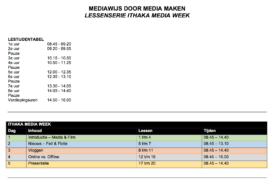 Subsequently we discussed the framework for the 5-day media literacy week lesson plan MMM team members Ena Omerovic and Hemmo Bruinenberg have developed in detail, in line with best practices observed during our pilot and developed in consultation with Ithaka ISK. Ena and Hemmo have setup a framework consisting of 20 lessons teachers can pick-and-choose from. The lessons balance instruction and discussion with a high level of making audio-visual media. The five days focus on day 1) introducing and reflecting on our media landscape, 2) news, fact & fiction, 3) vlogging, 4) online vs. offline, 5) presentation of footage and material produced by students.